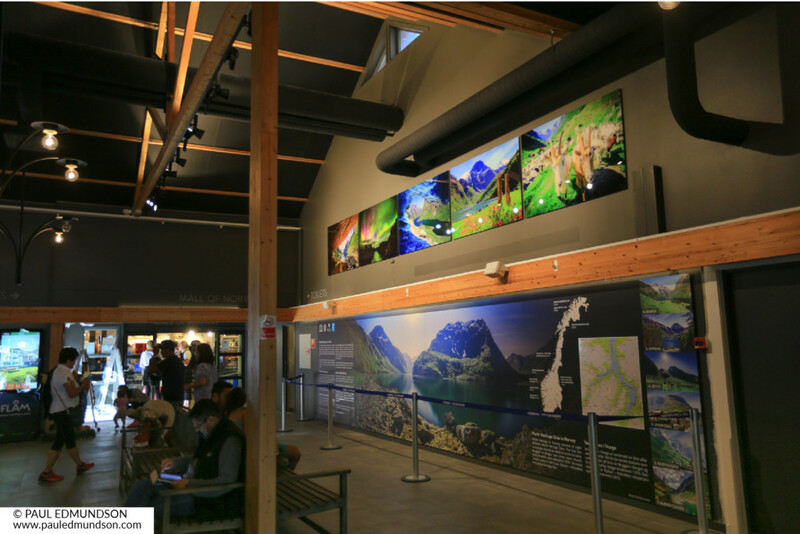 The sound of astonishment can be heard at the Visitor Center in Flåm, Norway, where a new spectacular fine art exhibition is leaving people in shock. 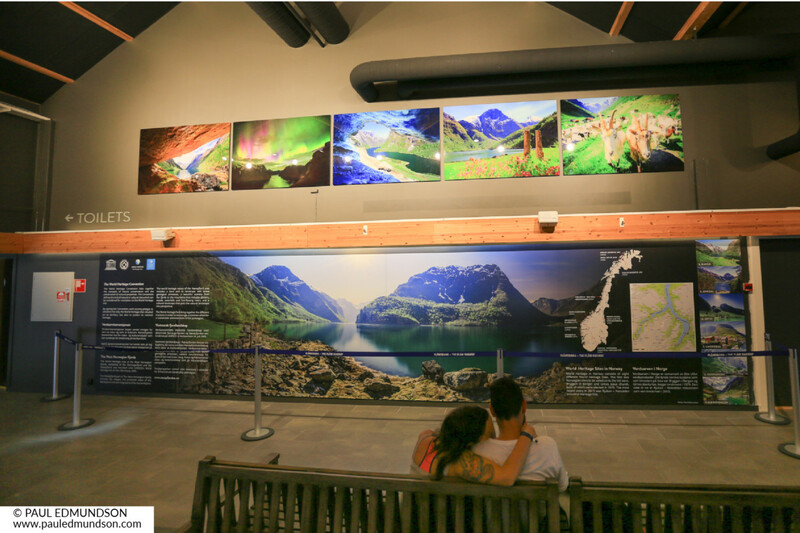 Photographer Paul Edmundson was commissioned by Nærøyfjorden World Hertitage Park to capture the heart and soul of the Nærøyfjord. 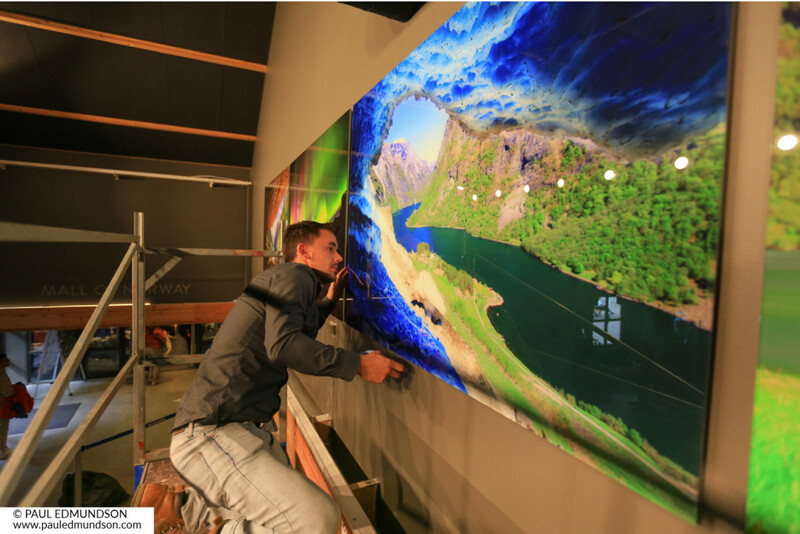 Paul’s extraordinary creation features a massive panoramic print, incredibly measuring a whopping 9 meters long. It almost feels like a virtual reality of being on the shore of the fjord. Above it hangs 5 fine art panels and 13 special spotlights were installed to release the full effect of the silver halide prints. Their sheer vividness makes the artwork pop out and look as though it is lit from within. The final result of three months of planning. 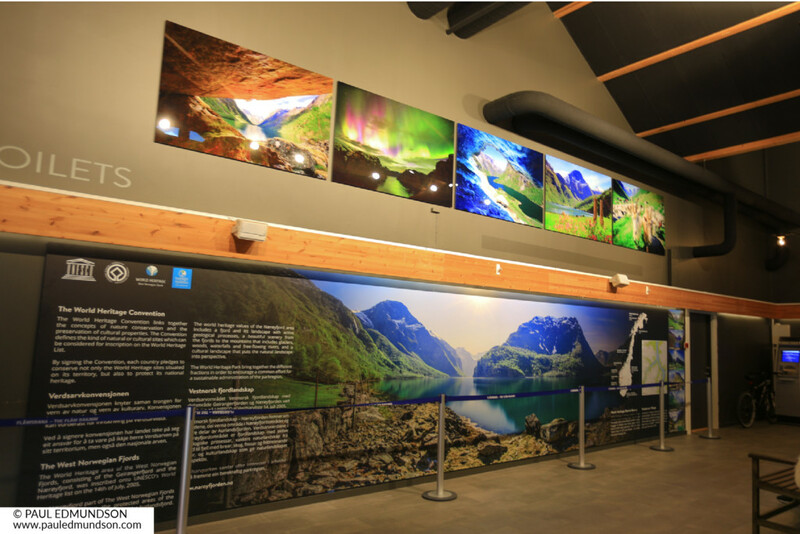 Having taken three months to create, the exhibition will be permanently on show in Flåm and aims to educate viewers about preservation of the world heritage site whilst showing off the Nærøyfjord’s unique beauty. An exclusive angle of the stunning fine art museum panels. Paul Edmundson who spent one month exploring the shores and mountains of the Nærøyfjord, says he ‘dedicates his life going to the ends of the world in search of the perfect shot’. He aims to ‘create incredible art that arouses emotions in the viewer to connect them to the power of nature’, and was selected as the photographer for the project because of his unique vision and vivid style. The result is spectacular, with one viewer saying ‘it is better than anything I could ever have imagined’. 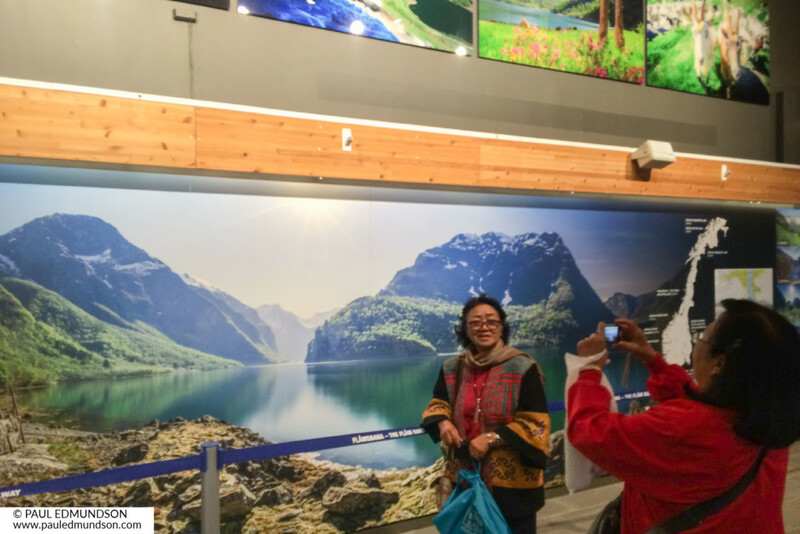 Birgittha Sandstrøm who curated the exhibition on behalf of Nærøyfjorden World Hertitage Park, was almost speechless, managing to say ‘it’s magic’ as she turned to tell the team at Flåm AS to stop work and go and see the exhibition. Every detail is meticulously checked by the artist. As a nature photographer, Paul searches for beautiful light, rich colour, and natural texture to add life to his scenes. The project required Paul to be at the top of his game, seeking out amazing images from the gruelling Nærøyfjord’s steep slopes, isolated shores and deep valley. “The Nærøyfjord is a very special place, and I spent a lot of time searching it’s beauty, exposed to it’s world heritage soul. It gave me a great satisfaction to be at one with nature like this and I am enormously grateful for having had the opportunity to experience the Nærøyfjord in a way few people ever have done” Paul. Viewers take photos ‘in front of’ the Nærøyfjorden. The photographer says of the exhibition: “Watching the art go up on the wall and seeing the show open to the general public almost brought tears to my eyes. The sheer size of it, the brilliance of the colours and the spectacular motifs that I was able to create, make me so proud of this show” Paul. 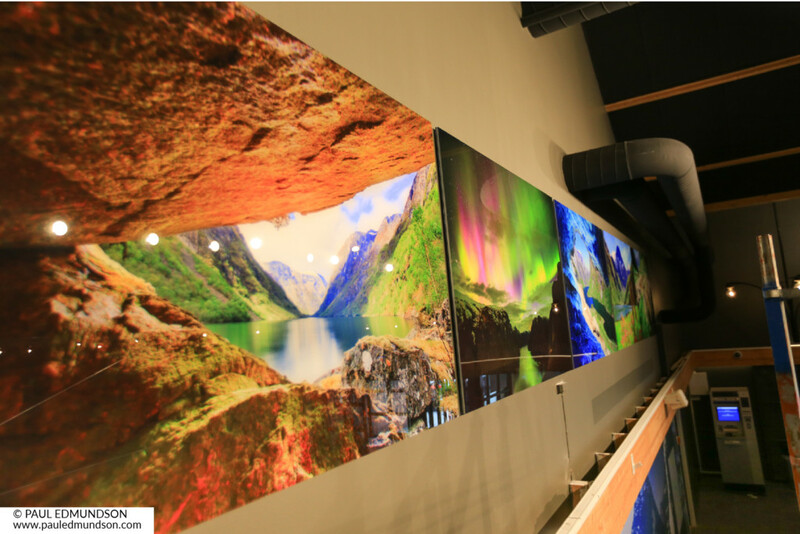 Five museum panels and one supersized panoramic print. The 5 museum panels exhibited are limited editions of 45 + 5 Artist Proofs and interested collectors are encouraged to contact Paul for a quote.